Alexander Alekhine, the fourth World Champion, played many fantastic attacking games and to this day enjoys the reputation of being an attacking genius. But ever since Alekhine won the World Championship match against Capablanca in Buenos Aires 1927 the chess world could see that the Russian-born Alekhine � who immigrated to France in 1921 � also handled technical positions excellently. But his success against Capablanca was still a surprise because the Cuban was considered to be virtually unbeatable. After winning the World Championship Alekhine reached the peak of his career in the early 1930s winning famous tournaments such as San Remo 1930 and Bled 1931 by a huge margin. Moreover, the World Champion was also a prolific author and in annotating his games gave deep insights to the thinking of a World Champion. 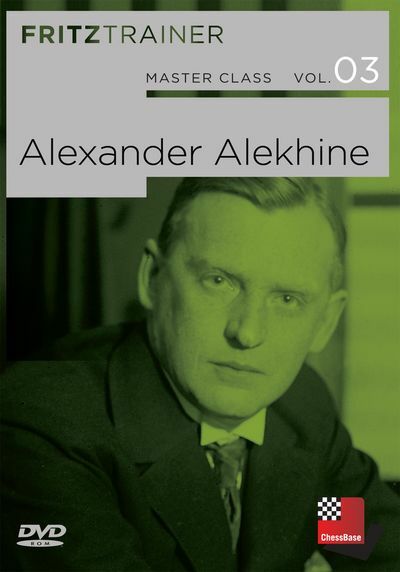 Alekhine was one of the best players in the history of chess and treated all phases of the game � opening, middlegame and endgame � in textbook fashion. No wonder a lot of later top class players, not least Garry Kasparov, claimed Alekhine as their role model in chess. On this DVD Grandmasters Dorian Rogozenco, Mihail Marin, Karsten M�ller, and International Oliver Reeh present outstanding games, stunning combinations and exemplary endgames by Alexander Alekhine. And they invite you to improve your chess knowledge with the help of video lectures, annotated games and interactive tests. The DVD also contains all known games by Alekhine, most of them annotated. Tables of important tournaments and various articles with background information complete the DVD. � Tactic training: 102 Alekhine games with training questions.